Today, the Bicentennial Half Dollar Coin remembers when the committee obtained money from Congress on February 16, 1876 for the Centennial Exhibition in Philadelphia. The Centennial Board of Finance, on assuming the duties of the great trust confided to them, met no greater embarrassment nor a subject demanding more decisive and immediate attention than the procurement of funds to meet the enormous expenses to be incurred in the necessary preparations for the Exhibition. In the absence of governmental aid or endorsement, an appeal to the people of the country seemed to be the only resource. And accordingly, as the amount subscribed prior to the organization of the Board fell far short of the authorized capital, efforts were made to obtain additional subscriptions by the appointment of local Committees in the different States and Territories. In the City of Philadelphia numerous and active Committees of the different branches of trade had been appointed in 1872, and these were continued, and secured large subscriptions. A Committee of women, of which Mrs. E. D. Gillespie was Chairman, contained a large number of zealous workers, and very thoroughly canvassed family households. But outside of the City of Philadelphia the subscriptions were not large. To reach such points it was determined to make a special provision, and a subdivision of the Directors was organized, styled the Bureau of Revenue. The Hon. William Bigler was appointed Financial Agent of the Board, to carry out the plans for increasing subscriptions that might be adopted by said Bureau. Under his charge and mainly by his personal attention the City of New York was thoroughly canvassed, and subscriptions obtained to a considerable amount, and in like manner the capitals of Massachusetts, Connecticut, Rhode Island, Delaware, and some other States were visited, and with tolerably favorable results. In these visits Governor Bigler was accompanied and aided by Committees of the Board of Directors. In connection with this work, General H. Seymour Lansing, the Auditor of the Board of Finance, was appointed to visit the Western and Pacific States, and so spent several months in zealously laboring to interest the citizens of these States in the Exhibition and in endeavors to obtain subscriptions to the capital stock. But outside of the City of Philadelphia and its immediate neighborhood it was difficult to awaken an enthusiastic support of the Exhibition. The State of Pennsylvania had appropriated one million of dollars, and the City of Philadelphia five hundred thousand dollars, for the erection of a permanent building, which has been known as the Memorial Hall. By the 1st of June, 1874, the United States Centennial Commission and the Board of Finance felt warranted in requesting the Governor of Pennsylvania to inform the President of the United States that provision had been made for the erection of suitable buildings for the purposes of the Exhibition. The proclamation of the President of the United States announcing the time for the opening of the Exhibition, and inviting the co-operation of the Governments of foreign countries, was then made. In the meanwhile, the plans for the erection of the buildings were prepared, and contracts were made for their erection. As the work progressed and the preparations for the Exhibition multiplied, it was found that the buildings originally determined on would be insufficient. The labors of the Board of Finance to procure subscriptions to the stock were incessant, but the result of all their labors in this direction was insufficient to meet the demands upon them for space in which exhibitors could be accommodated. In this emergency it was deemed advisable to make application to the Councils of the City of Philadelphia for a further appropriation of one million of dollars for the erection of two additional buildings, the Machinery and Horticultural Halls. In order to secure this appropriation a large public meeting was held, and the plan cordially indorsed by it. Committees were appointed to circulate and obtain signatures to memorials to the Councils praying them to make such an appropriation, and the movement met with such universal approval that the appropriation was speedily and with great unanimity granted. The work now went rapidly forward, contracts were made for the Horticultural and Machinery Halls, to be paid for out of this city appropriation. The plan for the great Agricultural Hall and the contract for its erection soon followed, and then those for the offices for the use of the Commission and Board of Finance; the Judges’ Hall and other subsidiary buildings followed in rapid succession. All this work was pressed forward with the greatest energy in order that there might be no failure to open the Exhibition on the 10th of May, 1876. The Board of Finance, however, found at the close of the year 1875 that their means for the payment of their contracts and engagements were insufficient, and in connection with the United States Centennial Commission the Board of Finance determined to make an application to Congress for an appropriation. This was granted to the extent of $1,500,000 by the Act of February 16, 1876, which the Supreme Court of the United States decided was a loan, to be repaid before any distribution of remaining assets could be made to the stockholders. The result of all the labors of the Board of Finance in the direction of procuring means for the erection of the buildings and the payment of all necessary preliminary expenses was, that the Exhibition was opened on the 10th of May, 1876, with all the debts of the Board paid or amply provided for, so that the admission money, the sales of concessions, and the final sales of the buildings erected with the money of the stockholders would be available for the payment of the remaining expenses of the Exhibition, for the reimbursement of the appropriation made by Congress, and for the repayment of the capital stock. To aid in fitly commemorating the Exhibition and the great event in the history of the world which it illustrated, Centennial medals were struck in bronze and silver, and were sold in aid of the general fund. When the repayment of the §1,500,000 to the United States had been made, it was deemed advisable, after reserving what was deemed a sufficient sum to cover all remaining expenses, to make a partial distribution to the stockholders on account of their shares of capital stock. In order to put the stockholders on as near a footing of equality as practicable, it was resolved to allow interest at the rate of six per cent, on all installments paid in between May 1, 1873, and January 1, 1876, and in addition to the interest so due to each stock holder, to pay $1.75 per share on each share of stock. Immediately after the close of the Exhibition measures were taken by the Board to sell all the property, furniture, and fixtures at public sale. In its own report will be found an abstract of the accounts of the Board, showing its receipts and payments to this date. 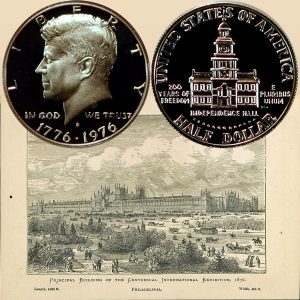 The Bicentennial Half Dollar Coin shows with an image of the main Centennial exhibition hall in Philadelphia.